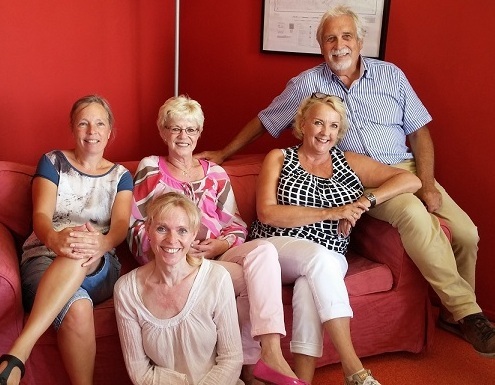 The Foundation Kidz Active was founded by Yvonne van Aalten-Hermans and Patricia van Aalten in cooperation with Hassan Frank Yakubu and Habiba Yakubu Mavis (both living in Ghana). The foundation papers are signed at the notary and registered at the Chamber of Commerce. The Chamber of Commerce number is: 24369927. Yvonne, Mary, Manon, Chantal and Patricia. 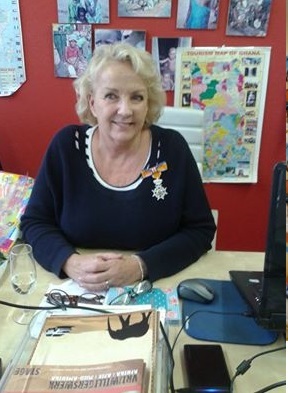 At the office in Zwijndrecht in 2016. Seated from left to right: Katinka, Mary, Yvonne and John. 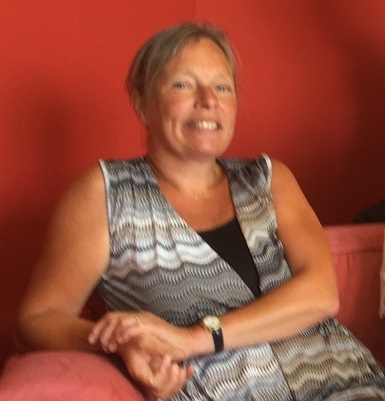 Let me introduce myself, I'm Yvonne van Aalten-Hermans, born in Amsterdam and living in Dordrecht, married to John and mother of Patricia and Daniëlle. I have always had my own businesses (25 years), but after a nasty crash at the end of 2003, I had to stop working. So then you get into a black hole, but I went in 2004 for a month with my girlfriend Willy Buwalda to Ghana and have found a great new challenge. 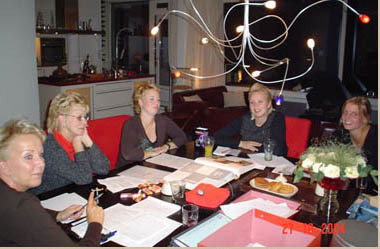 Together with my 2 daughters, Patricia and Daniëlle, my girlfriend Mary and her daughters Manon and Chantal, we have set up Kidz Active in December 2004. Our dream was to build a school in Tamale, Ghana. At this moment, we have built the school, 12 large classrooms and an office for the Director and teachers, followed by a storage space, also a proper toilets building with 3 boys and 3 girls toilets and toilets foor teh littleones. This is for Ghanaian concepts an unprecedented luxury. Also, there are two playgrounds realized, a sports field and there is akitchen for kooking the meals. 500 children will get a daily meal. The electricity is there, the computers are purchased, so our teachers and also the older youth and parents now get computer lessons. 80 women have a micro-credit, making their standard of living gone up significantly. Kidz Active has build and supports a liberary for the local people and children in Kpalsi. We have a large orphanage renovated, a more livable environment is created for this often orphaned children. We continue this and another orphanage (actually support financial) but also with assistance. And of course, we still support our invalids projects for which we also a better accommodation and workplace have built. There are now about 20 volunteers at the Kidz Active Team. All with devotion. I am very happy to belong to this Team. I am Patricia van Aalten. I am maried and have a son and a douchter. In 2004 I went for 3 months to Ghana to do voluntary work. My project consisted to teach disabled women and their children English lessons and counting. In the traditional village where I have lived, there was a strong shortage of money and also good teaching. Soon I was (and my mother Yvonne, who visit me in Ghana) positive that a school had to be considered for this disadvantaged children in the villages. My name is Mary Brand and born in the Hague in 1948. Y moved to Dordrecht by work. I have two daughters, Manon and Chantal and I am also Grandma of 4 grandchildren. After years of work, now it is time for voluntary work. When Yvonne and Patricia started with Kidz Active, it was not difficult for me to say yes to participate as a volunteer. 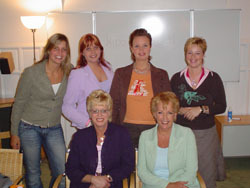 In December 2004 we started with our Foundation. Hopefully we can go on for a long time by this way to help the children in Ghana for good school education and a better future. If you have any questions about which vaccinations you need and what malaria pill is most suitable, you can always call me or send a mail. I’m John van Aalten and retired since 2008. During my working life I did a lot of work on shipping and shipbuilding. As the husband of Yvonne and father of Patricia and Daniëlle I could not stay behind to do some work for the Kidz Active Foundation. With the little knowledge that I have of computers I try to support the site of Kidz Active. My name is Habiba and I am a member of the Board of the Kidz Active Foundation in Ghana. I work as a school principal at a State school in Tamale and I am also a voluntary school principal of the Kidz Ative school in Malshegu (Tamale). I was born in 1956 in Yendi, a place East of Tamale and live and work in Tamale. My brother Hassan and I came in contact with Yvonne and Patricia van Aalten when she did voluntary work in Tamale in 2004. 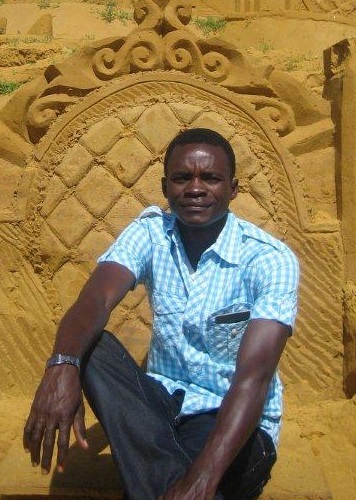 My name is Hassan and I work as a volunteer for the Foundation Kidz Active Foundation in Ghana. I was born In 1959 in Yendi, a place East of Tamale and live and work in Tamale together with my wife and 2 daughters. My profession is senior store keeper. In addition, I have a company in the distribution of soft drinks. I am a member of the Board of the Kidz Active Foundation in Ghana and I am mainly concerned with the micro-credits that Kidz Active provided to women in Tamale. My sister Habiba and I came in contact with Yvonne and Patricia van Aalten when she did voluntary work in Tamale in 2004. Hello I am Daniëlle van Aalten, daughter of Yvonne and sister of Patricia. For my work, I am accompanying young people with behaviour problems. I live with my friend and two cats, Poezzy and Moortje. When patricia and Yvonne started Kidz Active, I was enthusiastically about it. I decided to work for Kidz Active as a volunteer. So I help to collect money for Ghana. I was very sad that I still nothing had seen of Ghana. I had heard so many nice stories about Ghana that I wanted experience it with my own eyes and in June 2006 I was for one month in Ghana. I visited our projects, such as the disabled women and the orphanage, several schools and street projects. Now I really know where we do it for. I am proud that we are already as far as this . 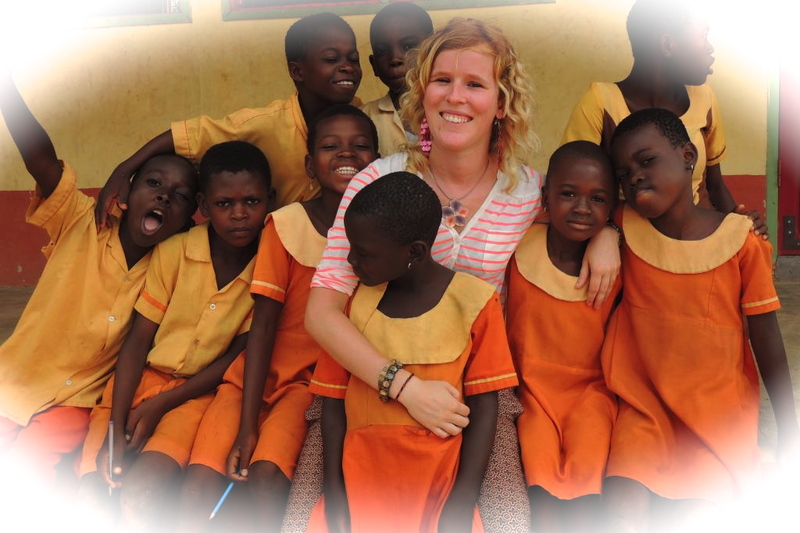 In the previous years I have been already several times in Ghana and cannot wait to visit our own school again. I am Chantal and I live with my friend, 2 sons and one daughter. From the first day I was volunteer for Kidz active, and I do this with a lot of pleasure. Organising activities and collecting money together with the other volunteers is appalling nice. My dream was to go to Ghana to be able to see the results of our efforts. Fortunately , I have been in Tamale in 2012. I am Manon Lagendijk, I am married and I have a lovely daughter and live in Barendrecht. I have worked four years at the Rotterdam police force, where I have learned appalling much. After that four years I stopt with this work. When Yvonne invited me to enjoy the team, I promptly said yes. You will see me especially as a volunteer when actions are planned to collect money for the children in GHANA. When I see what my daughter does for activities at her school, and when I see after that the pictures Ghana, I think by myself that I grant this for those children also. My name is Eefje Stans, I was born in 1989 and live in Oostende (Belgium). I love children and animals. I work in a kindergarten. A profession which I do with much love. My dream as a child was always to go to Africa and take care for children and to meet their culture. In 2013, this dream came true. With package and pocket I left by means of Voluntary Africa to Ghana. I have worked on the Kidz Active school and in the orphanage. I enjoyed both projects every second, sometimes with a tear because of the suffering which you see in Ghana, but especially the large smile on the children’s faces which looks at you with their dark eyes. For this reason I lost my heart in Ghana and try to go back as many times as possible. I will return in the summer of 2015 to Ghana. I want to be useful for the volunteers from Belgium who will work for the Kidz Active school. To accompany them, to answer their questions and give them the necessary information, so that they leave with as much enthusiasm to Ghana, such as I did! My name is Katinka Linnert, born at the 31th of March 1965, married with Tom. I have two sons, Koen en tijn. The past summer (2015) my son Tijn participated in a trip to Ghana, organised for teenagers. This trip was organised by ‘Vrijwillig Wereldwijd’. During this trip, he also did some voluntary work for Kidz Active. It has been an amazing trip. Because of his participation, I encountered Kidz Active. The organisation really appeals to me because in contrast to many other organisations, the money is well spent and everyone does the work they do without any other interests playing any roles. I will mainly focus myself on the financial side of the organisation and accounting in particular. I will also do some other smaller tasks when needed.